This article by Jannalee Rosner first appeared on LDSLiving.com on March 28, 2017. One of the purposes of early conferences was to unify and organize the Saints. One of the ways it did that was by settling member disputes and moral transgressions, including disfellowshipping, excommunicating, and hopefully future reinstating. Eventually a separate church court evolved to take care of both these secular and religious concerns. Bowery (right) that housed the first general conference in the Salt Lake Valley in 1848. Photo from LDS.org. Once conference began to be more consistent, at least a few sessions took place on April 6th, no matter what day of the week it was. Before that, conferences were simply called when needed, no matter the month or day. The first consistent pattern of conference every six months in April and October is traced back to around 1840. Photo of Tabernacle and foundation of Salt Lake Temple from Deseret News Archives. Past speakers at general conference have included stake and mission presidents, as well as representatives of the United States and Boy Scouts of America. Even the chief of staff of the United States Army has had time at the pulpit. Now we can expect to hear only from General Authorities and Auxiliaries. The last conference in the Tabernacle in October 1999. Photo from Deseret News by Jeffrey D. Allred. Starting in 1908 an auditing committee began reporting on the Church’s financial matters. Included in the report was usually the amount of money spent on individual categories such as maintenance and buildling cost of temples or church schools, as well as the amount paid to the poor out of tithing and other funds. By April 1959, the Church no longer accounted for specific expenditures, but began giving the more generalized audit of numbers of stakes, missionaries, and temples we currently hear every April. Images of the Financial Statements from April 1915 and April 1935 conferences. 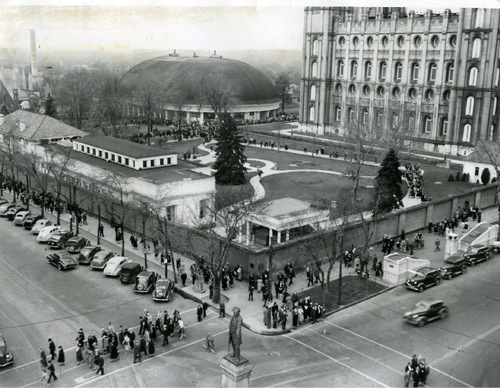 Photo of Temple Square in 1937 from Salt Lake Tribune Archives. For most of conference history, sessions lasted for three days, and some sessions were devoted to specific topics. In 1867, members even voted to extend the conference to four days for a short time. By April 1977, however the practice of a two-day conference over Saturday and Sunday was started. How do you know all of this, are you Mormon? Yes, the author of this article, Jannalee Rosner, is a member of the LDS (Mormon) Church.